The work of artist Julie Escoffier is based on principles of photography, though, rather than simply using a camera to capture the likeness of her subject, Escoffier takes cues from the material aspects of photography: light, chemicals and physical transformation. For this exhibition, “Ellipsis,” the artist, who splits her time between Mexico and France, has transformed the interior of the gallery to resemble the inside of a cave. Like an actual cave, Escoffier’s installation is defined by the presence and absence of light. Full-scale images of cave walls are wheat-pasted to the gallery walls. Upon the floor are scattered panels and chalky cast pillars that have been stained and treated with dyes and photosensitive chemicals. Among the sculptures, a crunchy layer of dried plaster and pigments coats the floor. 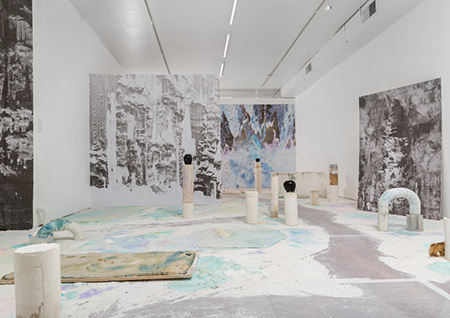 As sun pours in through the gallery’s storefront window catalyzing the objects’ chemical processes, and visitors methodically erode the floor’s plaster crust beneath their feet, the installation irreversibly changes. The ephemerality of Escoffier’s work is contingent on the relinquishment of control: the gallery has been transformed by the artist, and the artist’s work is at the mercy of the elements. Even viewers don’t have complete control over their own viewing experience, as the dust of the trampled plaster inescapably coats pant legs and shoes, remaining with the viewers long after they depart from this fragile, otherworldly landscape.